Old Republic Home Protection Reviews - Is it a Scam or Legit? Even though Old Republic Home Protection has 701 closed complaints with the Better Business Bureau over the past three years, they still maintain an A+ rating. From a customer satisfaction standpoint, the company appears to have an overwhelmingly negative reputation, with the most common complaints citing contractors who are only concerned about getting their Trade Call Fee, as well as poor customer service. Similar to American Home Shield, Old Republic Home Protection sells a variety of home protection plans intended to provide parts, repair, and replacement coverage for some of the most common types of losses. Unlike AHS though, Old Republic’s home protection plans are covered on a “named peril”—versus “all risk”—basis. In other words, if something isn’t specifically listed in your Old Republic contract, it isn’t covered. As the third largest national home warranty company, Old Republic Home Protection provides coverage in close to 30 states across the U.S., and pricing can vary by location. When performing our research, we chose Old Republic’s home state of California, and based our quote on a property less than 5,000 sqft, and that was a resale (e.g. not new construction). Standard – $275.00/year – Includes coverage for specific portions of your heating, plumbing, and electrical systems, including some appliances. Ultimate Protection with A/C – $175.00/year – Everything included in the Standard package, with expanded coverage for in-home systems. Ultimate Protection – No A/C - Includes Kitchen Refrigerator - $375.00/year – Same as above, without coverage for your A/C system, but with coverage for your kitchen refrigerator. Platinum Protection with A/C – $450.00/year - Everything included in the Standard package, with expanded coverage for in-home systems. Platinum Protection – No A/C - Includes Kitchen Refrigerator - $450.00/year - Everything included in the Platinum package, without coverage for your A/C system, but with coverage for your kitchen refrigerator. Whichever plan you choose, you’ll also have the ability to add additional coverage for your A/C system (if not already included), swimming pool and spa equipment, roof leaks, septic tanks, and more. For a complete rundown of all programs and coverages, please click here. All Old Republic polices last for 12 months, and will need to be manually renewed in order to continue coverage. However, rates are constantly fluctuating, so don’t be surprised to see your premium increase, even if you haven’t filed any claims. According to the company’s website, as your home’s major systems age, the likelihood of a malfunction increases, therefore necessitating an increase in your premium. In layman’s terms, this means that your first year’s premium will likely be your lowest, and will increase most years thereafter. After deciding which Old Republic Home Protection plan works for you and completing your purchase, your coverage will go into effect. If one of your covered systems malfunctions, you’ll need to complete a 24/7 service request by calling the company directly at (800) 972-5985, or by submitting a request through their website. Unlike American Home Shield, it appears Old Republic Home Protection offers emergency service, should something malfunction outside of normal business hours. Similar to American Home Shield, however, Old Republic Home Protection uses independent contractors that have been “carefully screened to meet our stringent service standards.” Once the contractor arrives at your home, you’ll be required to pay them the standard $60 Trade Call Fee, at which point they’ll assess the cause of the problem. Once found, and if it is something that’s covered under your specific Protection Plan, work will begin. Like many other home warranty companies, there are hundreds of online complaints stating that contractors hired by Old Republic Home Protection are “bottom of the barrel.” In other words, they appear to be most interested in collecting their fee and moving on to the next customer, regardless of whether or not your problem was solved. It’s also important to note that Old Republic considers a claim “closed” if past 30 days. This means that even if the same problem reoccurs in the same part of a system that was previously repaired, you will be responsible for another Trade Call Fee. This has led many consumers to the conclusion that contractors have even less incentive to perform proper repairs. Third largest national home warranty company, and operates in almost 30 states. Several different plans that provide varying levels of coverage. Claim to provide only high-quality contractors that are focused on customer satisfaction. Original rate is considered “introductory,” and will almost certainly increase upon renewal—even if you’ve never made a claim. Coverage is provided on a named perils basis, which can be more confusing and restrictive than all-risk policies. Almost all online complaints cite contractors who were more interested in getting paid than solving the underlying problem. Many customers have expressed frustration after making numerous calls for the same problem, only to be subjected to Trade Call Fees each time. I called them and they assured me that they would take care of the problem. It took all day long, at least 10 hours, before the plumber showed up. Once he showed up, the first thing he asked me was "have you paid the trade call fee," so I went, called his office and paid the fee with my debit card. He stayed another 10 minutes just to tell me that he could not help me, got back in his truck with his helper, and left. I want a refund, I want my money back. He left me without any water, my sinks, my toilets were all clogged, he didn't even try to help me. Old Republic, you got to do better, or Old Republic, you got to do better than this. I've been with you now for almost 10 years and paying you faithfully. For your customers that are faithful to you, you need to be faithful to them. Look at your plans and raise your standards of business. This is not even worth a rating, I give you zero stars. You let me down. It was raining...46-degree weather...I get it, you should not have lead me to think you would repair and not keep your word. I am very disappointed. I purchased a warranty in 2016 for my 12-year-old home. I was having no issues but thought I'll probably have to start replacing things eventually. Please note that I live alone and take excellent care of my home but at some point, things are just going to give out. 2017: On a Wednesday, I discovered my water heater was leaking. I immediately called ORHP. They told me someone would be sent that day. Nope. I called back and then received an email, not even a phone call, that they do not have any plumbers in my area. I was told to go on my own and find a plumber. I had one come on Friday. He informed me that it couldn't be fixed (I already knew that), he quoted me a price to replace it. ORHP informed me that it probably wouldn't be approved until sometime the following week. I explained that the tank was leaking and could burst. I pointed out that they had my money and now I was being penalized because they didn't have service people in my area! They did approve it that day and I paid for everything and received my reimbursement in about a week. At that time, I asked them if this was going to be standard or if they had actual service people in my area. Oh, no, they assured me they had people in the area. Again; NOPE! I renewed my policy in September 2017. 2018: South Louisiana, June...temps in the triple digits. A/C seems to be struggling, the house is pretty darn warm, and A/C is not shutting off. I made that call to ORHP. No problem, they are sending someone right out. Nope. Yes, that word will be used a lot during this review. I called them the next day and then received an email (again) saying they really don't have anyone in my area, go ahead and call someone and we'll automatically approve anything up to $500. Okay, this is looking like just a slight aggravation. Nope. I called an A/C company who came out and informed me that the unit had multiple issues because of the age and needed to be replaced. Uh, oh, I knew the real fun was about to begin. Another one-hour phone call to ORHP. I was then told to send an estimate and they needed to speak to the technician. He spent an hour on the phone and even sent pictures. One week and multiple phone calls later...hey, I have (you guessed it! ), another email! This one stated that they won't cover the type of unit the A/C company sells, they will only cover Goodman, Lennox or Carrier as replacements. Wait, what? Another one-hour phone call. Me: "You knew from day one what kind of units the company uses. Why did you wait a week to give me this info?" ORHP: "That's the way it is. Start over with a new company; it's too much money." Enter A/C company #2. The unit must be replaced, it can't be fixed. Here are three quotes; one unit (the least expensive) is almost identical to the first quote; the second unit, higher than all the others; third unit in the middle. The A/C company is on the phone for an hour with ORHP. By now, I know they are definitely stalling. I speak to a rep who informs me that they will not pay for a secondary drip pan (just keep the old ne that is rusted out), and they will not pay to flush the lines. Seriously? I asked where does it say that flushing the lines is not covered? His response? "Do you need me to read your policy for you?" Okay, now I'm about as fed up as I can get. I responded, "I have the policy in my hands, I actually read very well and nowhere does it state that line flush is not covered." He then tells me that I have a standard policy, not a premium policy. Nope. I totally paid for a premium, and regardless, either policy does not state that line flush is not covered. At this point, I do not wish to speak to this man again, so I ask for a supervisor who informs me that the only thing not covered is the drip pan. So that's $40, and I'll pay that, no problem. Well, nope. It's not that easy because you see, this still has to be approved. So while I thought I couldn't get more frustrated, I actually could. After phone calls EVERY DAY to ORHP for over one week, they finally agreed to pay. Not for the cheapest unit, mind you, but for the unit, that was the same price as the original quote! That process took two full weeks. Did I finally get my new A/C? Yes. Did I get my reimbursement? Yes. Will I deal with them again? NOPE! That's probably a good thing because today (come on, guess!) I received an email! This one was telling me they will not renew my policy. I really don't think I'll be crying myself to sleep over that email! Me and my husband purchased our home 7 months ago. We purchased a home that was built in 1976, so it was important for us to have a home warranty. My mom is a real estate agent and had sold thousands of warranties with Old Republic. About 2 months ago we woke up one morning and our house was almost 80 degrees and not cooling off. We have a 6-month-old baby (4 months old at the time), so we immediately called Old Republic to request that someone come and look at our AC unit. It was a Saturday morning, and we were told no one could help us until Monday, even after informing them we had a 4-month-old child living in our home. It took us almost a week to get anyone out to our home, and the first company they sent didn't even do HVAC. They were a handyman company. Once we showed how frustrated we were, they allowed us to have our own HVAC person come out. Fast forward, we have now had 3 different HVAC specialists at our home and 2 certified electricians. We have determined that our AC unit is pulling a lot more power then it should, which is causing it to trip our breaker. Old Republic just keeps trying to send out additional technicians every time we call. They won't give us a straight answer, and just keep telling us they have to send out a new person. We've had 5 different people out a total of 6 times, and they still want to keep sending out individuals. Despite the fact that they have been told if we replaced the unit it would stop tripping the breaker. Old Republic refuses to do anything until someone can tell them what is making it do that. But no one can figure it out. Now we are so beyond frustrated, it has been almost 2 months, and we need this issue fixed before it causes additional issues. So we are now paying the $2500 to replace our unit, even though we have a home warranty in place. Not to mention every time I've called their company the people I talk to tell me I am wrong and I don't know what I'm talking about. They are rude, refuse to let me talk to a manager, and tell me I'm impossible to work with. I'm pretty sure letting 5 individuals come to my home over and over again is being pretty patient. I would NEVER recommend anyone ever use this company. I can not believe the level of terrible customer service we have received. Absolute garbage. I had my A/C unit go out on a weekday at 8 p.m. I called and was told I will get an on-call person to come out. No call was made to me. No one came out. I called again at 5:01 am the next morning and was told they have assigned a company and they open at 7:00 am and will contact me ASAP. I had to call them at 7:30 and was told they will come out the NEXT DAY between 6:00-8:00 pm. Wow, okay, well, I'll get someone else to come out then. I called Old Republic back and got a voicemail stating if the time-frame is not good enough to schedule a third party come out and please call if it's over $500. I hung up, called a local A/C company and they were able to come out within a few hours. Later that day Old Republic called me stating that they have someone else that can come that day. This is after I already scheduled someone else and took my time off work to get this done. I went through the process, the cost was $665, I called Old Republic, and they said they don't know the cost but will contact me ASAP with the reimbursement. It comes to today, 11 days after everything, and no call (obviously), so I called them to get the information that a check is being sent for $137. I argued with them with the fact that they never contacted me back about having someone that can do it that day until after they told me I had to get someone myself to get it done today. Over the phone they even told me well, I could have canceled with the third party once we told you we had someone for you. Are you joking me? Why would I cancel with a company that has this crap together and will actually come out to my house ASAP when its 111 degrees F outside compared to a company that will randomly hire someone who said they will come in two days? Looking up the parts that were replaced for my A/C are over $250 by themselves. This company is a joke among all other home warranties. I will be waiting for a manager to contact me back about this (holding my breath) to see if they will make this right. We have held onto Old Republic coverage anticipating the day our pool equipment would finally break. Well, old age and wear and tear hit and lo and behold, Old Republic sent out a "technician" who couldn't even be bothered looking into our equipment far enough to see what the problem was. He gave a bogus cause and left. We called Old Republic and asked for another technician to be sent out which they refused. Needless to say, when you finally need a $2500 piece of equipment replaced, Old Republic refuses to honor their warranty. They just lost a customer who has faithfully spent over $1,200/year for 5 years in coverage fees as we won't renew our contract with them next month. Shame on you, Old Republic. I filed a claim. The first 5 people I spoke with said it was covered. After tons of work and finding a tradesman to quote and deal with them, they received the bill and suddenly it wasn't covered. They lie and cheat. Feds need to investigate their practices. Not the first time this has happened to them. Paid my bill in full, then they charged me more after the fact, TWICE! I had a problem with my pool. Old Republic sent someone out to fix it. Of course, that part wasn't under warranty. The repairman said it is with several other companies, but not this one. So I had to pay out of pocket about $200 for a fuze instead of a $60 trade call. I asked multiple times if this was everything I owed. Did this include my trade call fee? They told me yes. Months later I get collection notices from Old Republic telling me I owe a trade call fee! I explained the situation and told them I have the receipt they still told me I have to pay. So I paid $60 over the phone. Three days later they sent me another letter saying I owe $85! I called and asked why?! She said she sees I paid the $60 but now I owe a $25 collection fee! The only letter I got stating it was from a collection company was the last letter, dated AFTER I already paid the bill that I don't believe I owed in the first place! I told the lady I had just paid the bill! When I called, why didn't they take the $85 then? This is now twice they have come after me for more money AFTER I have already paid in full! On top of it, it was a fuze! It should have been $20 total. So I asked her "How do I know if I pay this bill that they won't come after me again asking for more?" It's disgusting! I did not pay the extra $25 because there was no supervisor to speak with. I trusted the last two people I paid, and they keep gouging me. Supposedly, a supervisor will call me back, but she told me the supervisor is still going to make me pay. We got a home warranty because our broker insisted on it and got the seller to pay for it. I did my homework online and Old Republic Home Protection had BAD reviews, American Shield and some other companies had better reviews, but it looked a little too 4-5 star compared to other companies. Back to my topic of Old Republic Home Protection (ORHP). I've been with ORHP for almost four years now, and I must say I'm satisfied. First of all, guys you need to do your homework and read the fine print, what's covered and what's not, it HELPS A LOT when talking to a rep to make a warranty claim and working through it. First, let me say what claims I've had since I bought the house. 1. Within a few months, our gas cooker knob got stuck. I called ORHP and they sent someone, tried to fix it, but could't fix it. They gave me a cash-out offer that I took and got it replaced with a brand of my own choice, and I decided to upgrade. 2. About a year into the house the garbage disposal broke. I called ORHP, and they sent someone to replace it. At first, he got a really cheap replacement. This is where doing your helps! The fine print in my contract (the whole contract is JUST 3 PAGES, so yes please READ IT) said they will replace it with an equivalent model or superior model. I called ORHP and told the rep (very calmly, they are very polite if you're polite) that the contracts says it is same, similar or better. Since my garage disposal was over ten years old, but a premium brand so they upgraded me to a premium model and had it replaced in a few days. Yes, everything takes a few days, so please don't complain. Just build it into your plan, and you'll be happier about it. 3. A few months later my garage door opener light stopped working. I happen to be an engineer, so I did a little checking and found one of the relays on the circuit board fried. Back to the contract, it said it will NOT cover light bulbs, but it DOES cover circuit boards. Again I spoke to ORHP and explained that the circuit board is faulty AND NOT the bulb or the socket. A few minutes of conversation and they agreed to replace it. Same things as earlier, they got me a Contractor Model, I pointed out that I had a premium grade model installed, so they upgraded me to the next level (this took some convincing, but they agreed in the end). 4. A year later the second garage door opener had a similar problem with the circuit board, and they ended replacing it, this time with some conversation with a model better since the older model was no longer manufactured. 5. A few months later in winter, my water boiler started leaking. I called them up and they sent someone. Similar conversation, same model or better models, did my homework, asked about the model numbers, compared them and was happy they had picked a good model. Now I was hit with a charge of $600 for doing the work from my end. This really pissed me off at first, and likely everyone I was in denial. Then my level head kicked in and I got in to the economics of it and the contract. The contract very cleared stated that they will NOT cover any modification required and code violations. With my house being 20+ years old and most of the equipment with it, yes, it didn't adhere to the modern code. My issue was with the fact that the contractor was charging me 3x-5x of what someone else would charge me for the same work. But if I decided not to go with him/her, then I had to cash out. The problem with cash out is that it barely covers the cost of the equipment, and that's because ORHP has LOTS of buying power and HUGE discounts, which we cannot get. So say they said the cash out value of my boiler was $600. If I went to Lowe's, it would cost me about $550-$600 to get a new one similar model. Then an installer would charge me another $800 to install it and the parts, etc. With ORHP, I had to pay $600 over what they were paying the contractors, and I now understand why. They pay the contractors SO LITTLE money for the labor that the contractors only make money by charging you back for it. So they literally paid the contractor $200 for $800 worth of work. So the contractor had to charge me the difference of $600 to make up for it, and they billed it under code violation (e.g. an air tank for $125 where it costs someone else $25). Now that's the trade off. You need to read your print. They were in the right, I have to pay for code violations and modifications, but at the end you'll end up paying less than going outside. 5. Now my AC starting giving trouble and wasn't cooling. NOW I was worried, from everything I've read on these forums. I called them up. They sent someone, he came and said I had a leak my ancient evaporator coil. Same rigmarole, they would charge me $500 for the code violations and modifications. I did the math. To replace the R-22 in my system and a new coil (they gave me a Lennox, I had a carrier originally, again pleased, good quality), and get it all fixed would cost me about $1500-$1800 on the market. I read the fine print, and they covered everything they said they will cover. So the guy got paid $200 from them plus $500 from me and they probably paid about $1000-$1100 for the R22 and equipment. I was IMPRESSED. They paid for the repair and I almost half didn't expect them to do it. Again I went through multiple rounds here, called in an expert for an alternative opinion, etc. It took two weeks to get it all done, but it is the peak of summer, and everyone is busy. But I MUST say they were responsive, even more than the contractors sometimes, answered all my 1000 questions and we all kept our cool. Guys, things take time, read the print, you WILL pay something out of pocket. READ YOUR AGREEMENT, I can't stress this enough. You will get more headway by referring to an agreement than by shouting at them. I know people have bad experiences but after four years I can positively say it's a mismatch of expectations. There are some VERY BAD home warranty companies out there what I've heard of from the technicians over the years, but ORHP is among the best and I can vouch for it. 1. Things take times, days to weeks depending up on the load, plan for it. They are helpful, if it's your only AC in the house they will prioritize it, if you have three, they will tell you it'll take a few days. FYI, they got my parts ordered in two days flat! 3. Do your homework and read your contract and have a reasonable conversation with ORHP. They are really nice and knowledgeable people, but if you shout they will cut you off. Have a decent conversation, they even helped me figure out how to negotiate with the contractors for non covered charges!! If you haven't heard it enough, here's one more time: read your contract and set your expectations. Then relax and enjoy! Thanks for reading all this and I hope it's been helpful. P.S. One last thing, my BIGGEST complaint with ORHP is that they ONLY give a 30-day warranty on their products and work. They should give the standard one year. 30 days is just pathetic, and often it takes more for trouble to crop up due to a bad install, but then it's past 30 days and you need to pay another trade fee. We recently purchased a home and with that a home warranty protection from this company. The home was recently inspected in April AND had it's routine servicing company here for cleaning, servicing, and simple parts repair in June. During the July months when the temperatures became high, we noticed that the indoor unit of our central AC unit had a leak. We contacted Old Republic for a service call, to which they delayed us and originally asked us to pay out of pocket and submit reimbursement. I disputed that, as I told them it wasn't an emergent issue and could wait until their techs were available (I am not a naive person, and I am very familiar with companies ability to bait and switch, so I did not feel comfortable up-fronting money only to be told claim denied for some bogus reason). They eventually sent a tech here in an unmarked van from NW Valley Mechanical. He had a ton of side comments about our system and the coolant used (again all from a prior reputable AC company). When he tested the outside unit he came up with the following theory (AFTER calling to speak with someone else via phone and verifying our home warranty coverage with them): "The unit was installed too close to the home causing your coil inside to freeze over." When we asked how that was possible when all the homes in our development were built the same, no one has ever noticed this in ten years with other owners of the home, it passed code when built, it had a home inspection that this was not mentioned on, AND and AC company was recently here that did not EVER mention that issue. He did not have a good answer other than bulk installations to barely pass code and home inspectors trained on a little about a lot. He submitted the claim with the hint that it was not likely to be covered and a side comment of "I'm curious to see what they are going to do about this one." 1) The unit should, by law, be 12 inches from the home, which ours is not, so that is the sole failure of the unit. I asked her how this passed code, inspection, and servicing to which she did not have a valid answer other than this coming from a trained/licensed tech. 2) I pointed out that they found the one problem NOT covered with a clause that it might actually be another problem but they couldn't test that potential problem until the unit was moved. I argued that their claim that this was the sole cause of failure then is not accurate. 3) She claimed the tech did not know it wouldn't be covered and when I corrected her that he actually verbalized it, she said he has nothing to gain by it not being covered. EXCEPT that he is THEIR TECH and just made $65 for NOTHING! They make service call cash. Now we face fixing the problem or most likely voiding the warranty in the future should the unit fail (not that I have much faith they would repair a unit when they won't even repair a leak). That comment was ignored by her. After much frustration and informing her that I would not be renewing my useless plan in the future because they are a bait and switch company that contracts techs and covers nothing (not to mention now has an "issue" documented that if you don't fix out of pocket, no voids your warranty), we did our research. This is not an isolated problem. There are long lists of complaints on multiple sources, including Consumer Affairs, about this duo of a team routinely misdiagnosing, other companies coming in after their claims to dispute, people with similar stories to mine of them always claiming that an original part or system is not correctly sized or installed. Also the clause in my added AC and "ultimate protection" that says improper installation is covered unless it is the sole reason for failure. Ironic that that this tech managed to make this a potential sole reason UNLESS it is the other part he mentioned, which he claims he can't check for some reason unless the unit is moved (ss I mentioned, I'm not an uneducated naive person, if it is the other part I would bet my life they would claim they wouldn't cover because they don't know if the location caused this failure, resulting in us again needing to fix yet another problem out of pocket not to void our warranty). THIS COMPANY and the DUO for that matter IS A SCAM! I have taken this to BBB for resolution as well as Consumer Affairs and Home Warranty Reviews because after my frustration with our situation I did research, and there is an appalling running list of this being the norm for this company and it's sidekick company NW Valley Mechanical. If I could give a zero rating, I would. I purchased their "platinum, top of the line" plan and less than three months into my home I learn what a joke Old Republic is. I bought a home less than three months ago, and for a peace of mind, I purchased a home warranty for a home that was 20 years old. Less than three months in the house, my HVAC unit goes out in the middle of Phoenix's summer. I think "it's a great thing I have Home Warranty." They specifically told me that my A/C unit was covered. They send out a technician the next day, and I am told by Old Republic that my A/C unit is still under manufacturer warranty and that this warranty supersedes my home warranty. What does this mean to me? This means the manufacturer will replace the parts, but I am responsible for paying the labor and the cost of freon. Total amount out of pocket is $2,200. I have the platinum plan, which is the best plan Old Republic offers. I also added my pool. I paid just under $700. I called some of the other higher rated home warranty companies and was told that if I had their warrant I would have been covered. I am now looking for a new company and wanted to warn other potential Old Republic consumers to stay away. Their ratings are low for a reason. You have been warned! Before we begin, I just want to let you know that I don't usually waste my time on the internet writing reviews. However, I would like to warn others about this huge scam before anyone else get deceive into flushing their hard earned money. Background: When I purchased my home a few years ago, my real estate agent assigned the protection of my home to Old Republic Home Warranty. Being a new and clueless home owner, I had no idea that I was being played in this mess. Living in the hottest city in the United States, where the temperature easily rises over 110 degrees, I have spent countless days in the heat, all thanks to Old Republic. Much like many other companies, the number one priority of Old Republic is to gain money from you any way possible, rather than to help and guide you in your needs. Allow me to explain. Customer Service: Your wait time easily ranges from 45 minutes to 3 hours. Unless, of course, if you are calling to renew a plan. Then, the wait time magically cuts down to a phenomenal speed faster than light itself. The other option you have for faster service is to wake up at five in the morning and give them a call. Did I also mention that 9 out of 10 times, your calls will be redirected back and forth? Also, the call system is a big flawed. Just recently, I called Old Republic from my primary cell phone, and the approximate wait time kept increasing. However, when I called the same number from a different phone, a woman answers the call in less than a minute. To sum it up, the customer service is basically a bunch of specialists trained to avoid customers in need. Service Timeliness: About a few weeks ago, my AC broke and I had to deal with 95 degrees temperate every night. How about now you ask? Still dealing with the heat. You see, Old Republic is the master of delaying your request until you get frustrated to the point where you pay for yourself and they smile at you with your yearly payments. Speaking from my experience, when my AC broke, I was connected to a "service provider" that consists of a person with a van who uses his cell phone for his job and doesn't have an office where I can go report my needs. My point is, Old Republic dug up these cheap and so-called "technicians" that have no experience. As a matter of fact, on my day of the appointment, I was told that his van broke and he wouldn't be able to come and that he and his buddy are the only ones working for the "company." And when they did send me a professional service provider, I was told that I needed to pay an extra $400 for my AC. You thought that you have your AC covered with Old Republic? Think again! Additional hidden fees will be thrown at you! The sad thing is, not only does Old Republic abandon you in your times of needs, but they use that moment to gain more out of you. Repair Service: The first time we called for AC and Old Republic handled it for us, being the new homeowner that we were, my family was very pleased and full of joy. We praised the company for saving us from the heat. Little did we know, our AC was hardly fixed. It was basically, "patched up" to be broken again. And sure enough, a few months later, another $75 flew out of our pockets. This continued until finally, the AC completely gave up. As I am writing this review, I am suffering in the heat of Phoenix, Arizona, where I am faced with either giving my scammers an additional "fee" or paying thousands to completely replace my AC. To further home owners, please avoid Old Republic Home Warranty, or you will be in the same shoes as I am. It has been weeks now, and Old Republic has done nothing in my favor. However, I will keep it posted on their course of action. For now, Old Republic is a zero star for me, and I won't be renewing anytime soon. 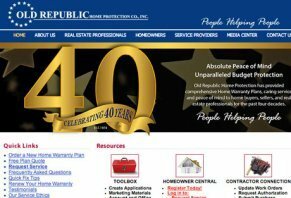 Write a Review for Old Republic Home Protection!